Photo credit: MINISTRY OF TRANSPORTATION & INFRASTRUCTURE. Big horn sheep cross an overpass designed and built for wildlife. The province has only four animal overpasses, but numerous underpasses and culverts designed for the passage of wildlife. Getting wildlife of all shapes and sizes across new and existing highways is becoming an increasing global issue, said Greg Czernick, chief environmental officer for B.C.’s Ministry of Transportation and Infrastructure. He said that highway planners struggle to find the right structure to entice critters to cross. “We use local people’s knowledge and experts, and also reach out to the international community to find solutions,” he said. 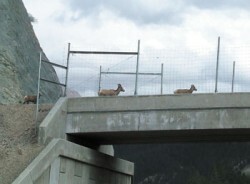 Canada’s first overpass for animals appeared on the Coquihalla Highway more than 30 years ago. It was ground breaking at the time, but the practice has evolved. “It is an element of highway design today,” Czernick said. He added that it’s especially important when constructing highways, where speed is a factor and a collision with any large animal can prove fatal for both parties. It is also a way of preventing animal deaths for endangered or at-risk species. B.C. now has four wildlife overpasses with the three latest installed on the Kicking Horse Canyon Project (KHCP) providing safe crossings for larger animals, such as Bighorn sheep. “To be honest, we are still learning and trying to find how best to do it,” said Czernick. A range of factors influence why animals will or will not use a crossing. There have been some surprising successes, and, some less successful ventures. On the KHCP, the Bighorn sheep were quick to use the crossing. “They actually supervised (construction),” said Czernick. The sheep watched construction from a distance, as crews formed up one of the concrete overpasses and placed wire fencing on the sides, put down a gravel path and placed shrubs at the entrances. They scrambled over the crossing even before it was completely finished, he said. The $1 billion upgrade of the Sea-to-Sky highway for the 2010 Olympics saw it realigned through an area of ponds traditionally used by the red-legged frog to move to and from its breeding grounds. A $1.5 million project to install a culvert large enough for a man to walk through didn’t find favor with the red-legged frogs. As the Globe and Mail reported in late 2010, frogs are still croaking as they became road kill. Amphibians can be tough to lure into crossings, admitted Czernick. Conditions have to be just right. “If it is dry, it is not as enticing to them,” he said. He explained that a stream might not be the right condition either, as frogs may want to move along the damp shoulders. “There are things we are trying to do,” said Czernick. Culverts or underpasses have also been placed on the KHCP and range from .4 to four metres with the size depending on whether it is fish or footed animals that need to be accommodated. The location of the overpasses or underpasses is usually determined by the animal’s traditional path or a perimeter fence guiding the animals to the crossing, Czernick said. B.C.’s Port Mann Highway Improvement project has also had its environmental challenges with critter crossings. There are about 15 “e-culverts” being placed along the improvement route to accommodate fish, with just as many or more for animal crossings, said Greg Johnson, Transportation Improvement Corporation (TIC) communications manager. “The idea is to match the width of them to the width of the stream,” he said, referring to the box culverts used on fish-bearing streams. The culverts are usually craned into place at night in order to limit the disruption to traffic, however, when there is an existing culvert and the road is being widened, Johnson said, the new culvert is pushed through the old one. The culverts accommodate a spectrum of critters including salamanders, painted turtles, coyotes and raccoons. The crossings become especially important as TIC enhances surrounding habitat. Currently, the highways ministry is also testing a new solar-powered LED deer-warning system on Highway 97, south of Williams Lake and Quesnel. B.C. The road signs, depicting leaping deer, are programmed to flash at times of the year and day or night, when deer are most prevalent on the highway.